The legendary runner is less than a year away from vying for a third consecutive dominant Olympic performance. But as he nears the end of an unprecedented career, questions of doping in track linger, and the competition is gaining on him. Usain Bolt won the 200 meters, then grimaced while his time was confirmed. 20.29. He walked gingerly along the track’s curve, clenching his teeth as he caught his breath. The place pulsed with joy. The race was on Randall’s Island, a knob of land in the waterway between Queens and East Harlem, but for Bolt, it might as well have been home. The shirts in the stands were yellow and green, tents advertised Jamaica Airways, the concessions sold jerk chicken, the crowd was on its feet. People had waited for these 20 seconds for hours, enduring the rippling heat and wave after wave of unknown runners. They had come to watch Bolt win, and Bolt had won. There was no sign, not in the stands, that anything was wrong. But on the track, the fastest man in the world appeared distracted. He’d had trouble on the curve, and even while outrunning the field he hadn’t shown his old explosive speed. It was strange to see him like this, tense and disturbed. He accepted a bottle of orange Gatorade and a bouquet wrapped in cellophane without a smile. Then he turned around, dropped the drink and the flowers, and took off his shoes. The last time Bolt had raced on this track, he’d raised his arms as he crossed the line. One hundred meters, 9.72 seconds. He’d kept sprinting, running around the curve. He’d pounded his chest, skipped as he slowed, and soaked in the crowd’s wild roars. “Usain Bolt has run the fastest 100 meters in the history of humankind!” the commentator and former sprinter Ato Boldon had shouted on the TV broadcast. 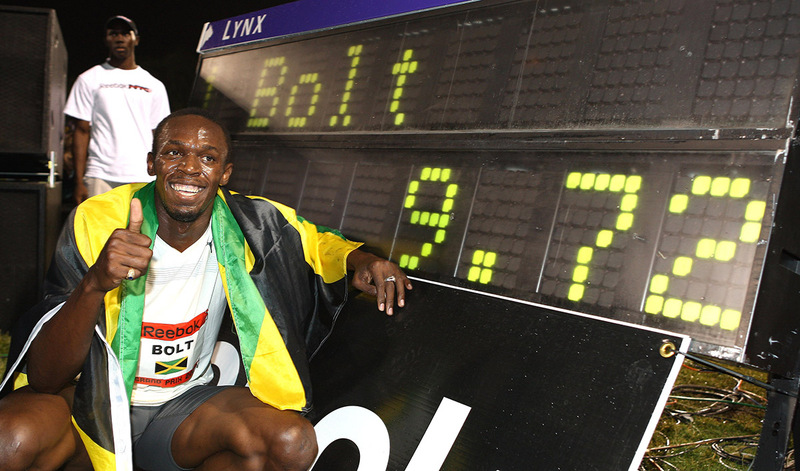 It was Bolt’s first world record. That was seven years ago. The mood this June was different. Right after his race, Bolt met with the press. He waited until the last moment to push his sunglasses up onto his forehead. 20.29. Bolt’s goal on Randall’s Island was modest: He’d only hoped to break 20 seconds, well off his 19.19 world record and his ultimate goal of breaking 19. “I don’t know what happened,” Bolt said. “I really can’t explain. It was really bad. It was probably one of the worst turns I’ve ever had in my entire life. I don’t know.” He was tense. He shook his head. The worst? “The worst,” he said again. In February, Bolt announced that he will retire after the 2017 world championships. In less than a year, he’ll run in his last Olympics in Rio de Janeiro. He is hoping to become the first person to win three consecutive 100- and 200-meter Olympic gold medals (and the 4×100 for good measure); he is already the first to win them twice.1 His fans, and many within track, are hoping he’ll ease gloriously through the finish — and perhaps he will. Bolt has always performed his best at major competitions, and he’s set and smashed his own world records at the big races, when people are watching. But last summer, Bolt struggled with injuries, had surgery on his left foot, and shut his season down after only three races in order to focus on this year. The results coming into the race in New York were disappointing. Bolt holds the world record in the 100, having run a 9.58 in 2009, but his fastest 100-meter time of 2015 is only the year’s sixth fastest. He’s also the world record holder in the 200, and his best this year is only the 19th fastest. Others do. Bolt transcends the sport — and lifts it. For a quarter-century, track has been in trouble, hit by doping scandal after scandal. Now new drug-use allegations have heightened the sense of crisis. “We can’t keep sweeping it under the carpet,” said Darren Campbell, a British sprinter, now retired, who won Olympic silver in the 200 meters in 2000 and gold in the 4×100 in 2004. Victah Sailer/Getty Images Bolt celebrates in 2008 after setting a world record in the 100 meters in New York. A sprint seems so simple. It’s intuitive, part of our hard wiring: fight or flight. On fields, in forests, on playgrounds, in stadiums — the first one from here to there. Its clarity is part of its thrill. But it turns out that few competitions are so vulnerable to manipulation. The footrace can be turned into an arms race, feats of chemical engineering and conspiracy. This has been true for a long while. Of the eight contestants in the 1988 Olympics men’s 100-meter final, six have been connected to doping in their careers. More recently, the long rap sheet of those caught in doping scandals includes Asafa Powell, whose world record Bolt broke that night in 2008, and Tyson Gay, whom Bolt beat when he broke Powell’s record. It also includes Gatlin, Bolt’s biggest challenger right now. Gatlin has failed two doping tests, the first, in 2001, for an ADD medication and the second, in 2006, for high testosterone levels; he served a one-year ban and a four-year ban, respectively. (He denies wrongdoing and blames his masseur for sabotage.) “The critics are going to say whatever they want to say probably for the rest of my career,” Gatlin told me in 2012, near the start of his comeback. And they have. The British press routinely refers to him as “drug cheat Justin Gatlin.” Even USA Track & Field has not heavily promoted his success — if only to insulate him from the negative attention. He’s been made a poster boy, singled out for what is a far bigger problem. “I discredit the British press, because they are hypocrites,” said Renaldo Nehemiah, Gatlin’s agent. “They have their own from those amongst them who have tainted pasts.” The United States Anti-Doping Agency, which has perhaps the most rigorous and transparent testing program in the world, recently published figures showing that Gatlin has been tested 59 times since returning. “He’s probably the most scrutinized and victimized athlete,” Nehemiah said. 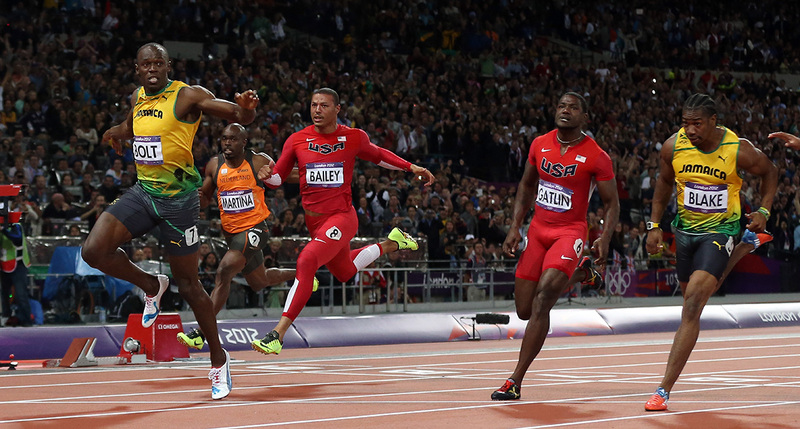 That’s precisely what worries some in track: the potential of a champion with Gatlin’s history. Britain’s Sebastian Coe, the just-elected International Association of Athletics Federations president, has said he is “queasy” at the prospect of Gatlin winning. Forgiveness is hard to come by — precisely because the problem is clearly bigger than any one man. U.S. track was recently rocked by allegations that the nation’s most legendary distance coach, Alberto Salazar, encouraged his athletes to approach the line on doping rules — and perhaps encouraged them to cross it. Two years ago, a World Anti-Doping Agency survey found that 29 percent of athletes at the 2011 world championships, responding anonymously, admitted to doping in the past year. At the Pan Arab Games, the figure was 45 percent. In both cases, WADA sought to delay publishing the results. What if cheating becomes so endemic that it starts to seem integral? What if track actually is what it sometimes seems: a vast conspiracy of scientists, coaches, doctors, entourages, shoe companies, network execs, and officials tortured by the fear of scandal? “You could have hooked us up to the best lie detector on the planet and asked us if we were cheating, and we’d have passed,” the cyclist Tyler Hamilton wrote in his memoir, The Secret Race: Inside the Hidden World of the Tour de France — Doping, Cover-ups, and Winning at All Costs. Hamilton’s logic is simple, if perverse: Doping corrects for genetic discrepancies and enables athletes to train longer, push themselves harder, and succeed because of dedication and effort. It challenges just what a fair and level playing field means. This is the universe that Bolt dominates. 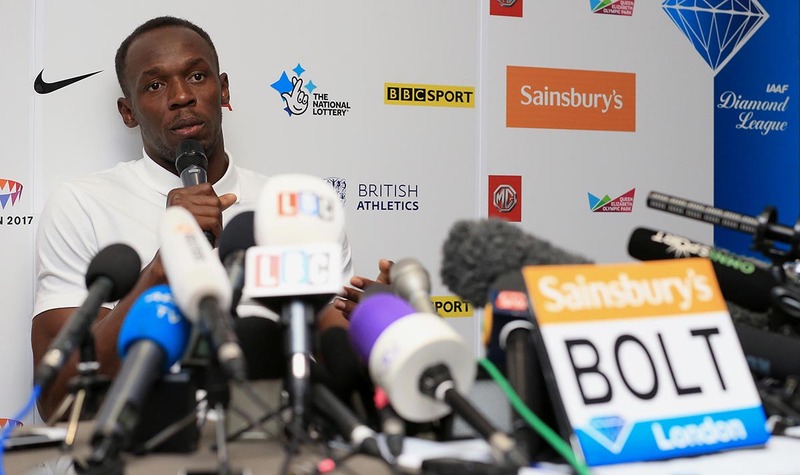 Stephen Pond – British Athletics/British Athletics via Getty Images Bolt speaks during a press conference in July in London. We celebrate dedication and desire, but also what’s inherent and unearned. We could describe accidents of birth; instead we talk of talent. By the age of 15, Bolt had reached 6-foot-5. His height lets him cover ground in fewer steps than other runners; it takes him 41 steps to run the 100 meters, whereas Tyson Gay, at 5-11, needs 44 or 45. But height isn’t usually an advantage. Taller sprinters traditionally have bad starts; it’s harder to reach top speeds quickly while unfolding a long body, and lengthy legs are slower to turn over. Bolt, though, has an unusually high percentage of fast-twitch muscles, strong hips, a fast stride rate, and a relaxed but efficient style. He hits the ground with a thousand pounds of force, twice what most humans can do. Norman Peart, his manager, remembers watching him run relays when Bolt was 15. Other sprinters have low centers of gravity, compact bodies, legs like pistons. Gatlin, for one, is built like a train. Bolt spends more time in the air. He seems to soar. Somehow, the ease with which he has won has helped make him seem human. It’s been part of Bolt’s charisma; he is at once supremely arrogant and never takes himself too seriously. He breaks world records without seeming to try his hardest. He has broken world records in Beijing fueled by Chicken McNuggets. He has slowed to celebrate before reaching the finish line. He has cultivated the legend of his laziness. It’s Bolt’s talent that fuels the public’s conviction that he’s clean — the fact that he produced phenomenal times when he was in his mid-teens. He is one of the generational figures in sports, like Michael Phelps, who is a genetic freak. This isn’t proof he’s not doping, of course. Remember the odes to the length of Lance Armstrong’s femur? But there is no doubt Bolt was a prodigy. He was a junior world champion in the 200 meters in 2002; by 2004, he was breaking 20 seconds. The Athens Olympics were a disaster; he was hampered by back problems and a leg injury as he struggled to adjust to scoliosis, a curvature of the spine. But when he started working with Mills after those Olympics, he learned to compensate for his body and develop the most efficient stride — and to strike a balance between intensity on the track and fun off it. In 2007, he broke the Jamaican record in the 200 meters, won silver at the world championships, and clocked a 10.03 in his first year of running the 100 meters. Then came 2008, the world records, the legend. And he kept winning when people were watching — overcoming injuries after a car crash, and perhaps overcoming apathy whenever he stepped to the line. One tragedy in our cynical age is that it’s hard to take innocence for granted. Armstrong never failed a test either. Jamaica’s testing program has historically been lax, but several Jamaican stars have failed tests in recent years, and in late 2013, the country’s senior tester said the failed results might be “the tip of the iceberg.” The head of Jamaica’s anti-doping agency, who has since resigned, reported that in the six-month run-up to the 2012 Olympics, the agency performed only one out-of-competition test. The program has since been audited and overhauled, and Bolt in particular is routinely screened. But that doesn’t insulate him from suspicion. “I’m still working with the fact that he dropped from 10-flat to 9.6 in one year,” Carl Lewis, a former U.S. Olympic champion (who has admitted to failing to several doping tests), told Sports Illustrated after the Beijing Olympics. “I think there are some issues. I’m proud of America right now because we have the best random and most comprehensive drug testing program. Countries like Jamaica do not have a random program, so they can go months without being tested. I’m not saying anyone is on anything, but everyone needs to be on a level playing field.” But in the public consciousness, at least — and in my own gut, naive as it may be — Bolt is immune to rumors about PEDs. Nature cheated for him. He has done things people couldn’t believe, but he made them believe what they had seen. Streeter Lecka/Getty Images Bolt crosses the finish line to win gold in the 100-meter final in London at the 2012 Olympics. What nature gives, nature takes away. Bolt has been running two races at all the biggest meets for years. His body has blessed him, but it has his curses — a curved spine, one leg that’s a little shorter than the other. It becomes harder to heal from injuries as he grows older. Sometimes the ground can seem to tilt uphill. This spring, Bolt pulled out of his upcoming meets, citing a blocked joint in his pelvis, and went to Munich to meet with a doctor. His next race came at the end of July, at the Anniversary Games in London. He ran a 9.87, and people were talking about him challenging Gatlin. The euphoria that followed Bolt’s performance in London was largely relief, but it also felt a little forced. 9.87 is a fast time — but only the sixth-fastest this year. The first round had looked easy, with that quality Bolt always used to project — that sense of holding something back, of opening the possibility that any time was possible. (Sub-9.5? Why not sub-9!) But the final looked labored. He’d struggled visibly with his start on the second race of the day, and his kick had lacked that characteristic cool explosiveness. You could see the strain. He’d reached for the limit, not pushed it back. So why is he running? He’s not addicted to the training. But he sees himself as different, a living legend, out in front of the field. Now the complex calculus of natural talent, work, and will is changing. The playing field is shifting, never level. Bolt has given up the pre-race McNuggets and the late-night junk food; his cooks are paid to turn down his bribes. He’s focusing on sleep, which he calls a weakness. He’s working very hard on not playing video games all night. “I think there’s going to be zero fun next season for me,” he said in London. Maybe all that matters in track is that people run fast, that the time is kept, and that someone wins, and it doesn’t matter what went into it. The fastest man in history is running toward his finish, coming around the turn. Technically, Carl Lewis has two consecutive Olympic gold medals from 1984 and 1988, but was given the latter by default after Ben Johnson was disqualified for doping. The suspect results were especially notable in endurance events, and athletes from Kenya and Russia had particularly troubling results. Bolt was cleared by name. Others have pointed out that benign factors, such as altitude or pregnancy or inadvertent contamination, can lead to suspicious tests. Campbell became involved in the nutrition business partly because of his fear of cross-contamination in food; he now has a company of products screened for banned substances, Pro Athlete Supplementation.